The Doctor: Mysterious traveller, savior of civilizations, proponent of nonviolence, and fictional character...in case you couldn't tell. 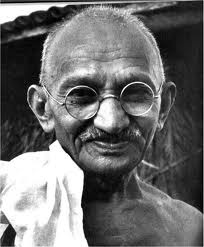 Mohandas Karamchand Gandhi, also known as Mahatma Gandhi was born October 2, 1869 in Porbandar, India. he went to school in Rajkot. He was not the brightest pupil but enjoyed reading very much. After school, Gandhi traveled to London to take law examinations. He also studied French and Latin while in London. After Gandhi had passed his law examinations he returned to india to finish practicing law. When Gandhi had returned to India he found out that his mother had passed away while he was in London. He had never got to say goodbye or tell her how he was now a lawyer. Soon after Gandhi found out his mother had passed away, he received an offer to be a legal advisor in South Africa. Indians were poorly treated in South Africa. Given the nickname 'coolies' indians were not looked at as equals to any Europeans. When gandhi boarded a train to South Africa he was kicked out for being indian. Gandhi was outraged but instead of come at the situation violently he decided to lead a revolution of peace. He is one of the largest symbols of piece and freedom the world has ever seen. Mohandas Karamchand Gandhi was assasinated January 30, 1948 by Nathuram Godse.